Interview with Marina Go Ovarian Cancer Australia Board. Marina Go is one of Australian publishing’s success stories. From Editor of Dolly Magazine to GM at Bauer Media, the current Chair of the Wests Tigers NRL Club is a nimble, creative thinker. 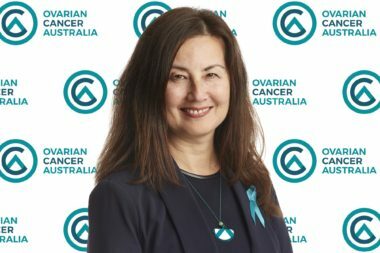 She now joins Managing Director of Twitter Australia, Suzy Nicoletti and Deloitte Partner Meghan Speers, on the newly expanded Ovarian Cancer Australia Board of Directors. To increase the disease’s survival rate by at least 25 per cent by 2015. 1,600 Australian women are expected to be diagnosed with ovarian cancer in 2018. 1,000 of those will have their lives cut short. Martine Harte: Congrats on your appointment Marina what do you plan to bring to the role? The organisation is working very diligently with a very small team, but the level of awareness about the disease is relatively low. What I like about this particular organisation is it’s investing in research and awareness, because one of the biggest issues is ovarian cancer is one of the hardest cancers to detect for women. If you don’t know what you need to look for then it becomes too late by the time you are actually confronted by the symptoms. The end goal is to save more lives. No better goal than that. Can you share any of the strategies you think need to be implemented immediately? One of other directors who has joined is Suzy Nicoletti, the MD of Twitter. The way most people receive information these days is largely non-traditional, so helping organisations who have traditionally looked to mainstream media to get the message out to try and find cut throughs via direct channels such as social media. Also gaining more of a profile for Jane Hill as CEO, as well as some of the case studies of the women we have worked with, getting their stories out there in a way that is meaningful to more Australians. So we should mention them in this piece. Marina Go: They are everyday symptoms like bloating. I feel bloated every other day, there’s fatigue… but we all feel tired. Obviously, if you get some pain in your abdomen that’s going to be an issue but very often by the time the pain sets in that’s when it’s too late. Frequent urination is another symptom. That’s why this is an illness that needs serious attention. (Editors note: excellent Ovarian Cancer Aust signs and symptoms info here. Martine Harte: Should society perhaps broaden the symbolism beyond attractive people in white shirts (not that there is anything wrong with that campaign) but is there room for a broader conversation? Marina Go: I totally agree, that’s why I think we need to get the real stories out there. The women who have been through it; the concept of showing what the bloating looks like is the reality we need because otherwise it’s a set of words. We need to show more imagery, we need to do more than tick off words on a checklist. At the moment the visual representation of Ovarian Cancer is an attractive woman in a white shirt; I agree with you. Martine Harte: And there’s nothing wrong with that we should point out! No, but the reality is in many cases people are buying a shirt but it’s not necessarily purpose-driven. We need people donating, as well as other people helping raising awareness. We have to find a way to make it more personal for Australians, other than those who the BRCA1 or BRCA2 gene is in the family. It’s in my family. I do get approached a lot by organisations asking me to join boards. I can really only devote time to one charitable cause so I’ve chosen this one primarily because my husband’s family (therefore my children) have a genetic disposition to BRCA1 and he was tested last year and he is positive. We have two sons, we haven’t had them tested yet. The boys could still be carriers. Many women in my husband’s family have had ovarian cancer or breast cancer. The comedian Lynda Gibson who started Ovarian Cancer Australia and unfortunately died from a very aggressive form of ovarian cancer; was my husband’s first cousin. She is one of the women in the family who died. Back then they didn’t know they had the gene. Thank goodness for medical science. Marina Go: Thank goodness! My heightened interest is in improving the awareness and increasing the funding for research so we can actually try and increase the survival rate. The survival rate is too low. It’s the biggest cancer for women and that’s not ok.
Find out more: about Ovarian Cancer Australia here. I also asked Marina about feminism and finding her voice. Look forward to sharing her insights with you soon. You have had a fascinating career over many decades, I’m wondering whether your varied career speaks of your ability to be nimble? Yes I think that’s right. From very early in my career I said I would manage my career like a business. What businesses do is they see opportunities and they develop a skill; they develop an asset in that area that fulfils a need. I’ve always been a forward-planner, I look ahead at where the opportunities are going, where does it look like I’ll get an opportunity if I want to progress? I then develop a skill set. I have educated myself along the way, and then taken the leap of faith. I think one of the biggest issues is risk. A lot of organisations who have been modestly successful are terrified of taking that next step which takes them into a new area of opportunity because they are terrified of letting go of what they had. Even though letting go of what they had can get them to the next stage. I always think: Who’s going to disrupt this business? What would you do to create an organisation that is going to kill the one you are in, then I look at that and I think well what skill sets do they need to have? Maybe they need to go off and develop those skill sets. In relation to this disease we need to have a community which understands which symptoms they need to look for. Ever considered joining a board? Tagged in Ovarian cancer, Ovarian Cancer Australia, Ovarian Cancer Australia board.